The R240 is the Zoe with the new, more efficient, air-cooled motor that Renault developed in-house. There is some consensus that the battery of the R240 is exactly the same as the Q210, but given the different characteristics of the motor, and the fact that the motor coils are used by the charger (very smart design!) it is capped to charge at a rate of 22 kW maximum. 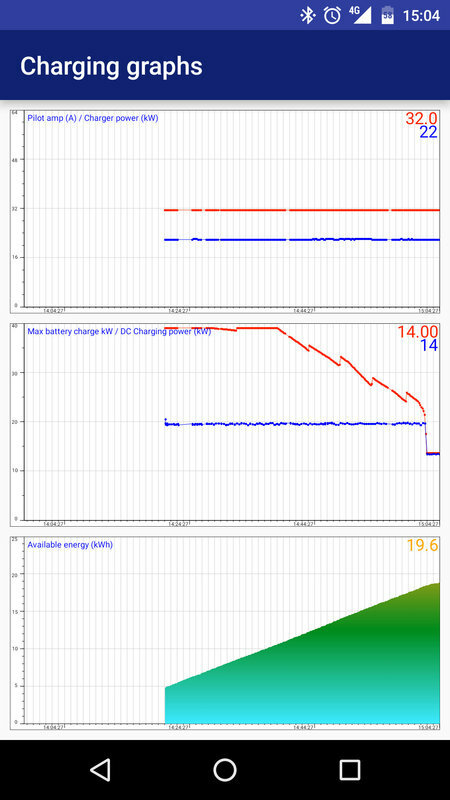 A UK based Zoe driver noticed the “Max battery charge” nicely went up way above 22 kW and asked how that could be. Today, user Crf supplied us with this CanZE graph when charging his R240 at a 43 kW charger, and I believe it confirms what we were thinking. The Zoe simply caps the incoming pilot and fakes it’s value towards the other systems involved. Notice how it reports 32A and 22 kW available power. Those numbers are both off and way too neatly rounded. The battery itself (the LBC’s) reports it’s willingness to take the full 40 kW DC power load, and as the SOC goes up it starts it’s capping at roughly 11 kWh. Again, the little jumps we believe is caused by the temperature rising. 2 kWh per degree Celsius is ballpark right. The very rapid capping near the end is kinda interesting. So yes, it seems like the R240 has the same battery as the Q210. The BCB is tweaked a bit to simply ignore anything above 22 kW and the rest of the car simply behaves as if a 22 kW charger is attached. The little jumps in the chart are indeed caused by the temperature rising. It is measured in whole °C. In most cases the temperature of the coldest modules is taken. If the one module would have a temperature above +/- 45°C it will also limit the charging power.